Gunnar and Tevin learn about Jojo's from their friends in South Africa. 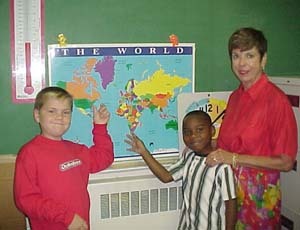 Gunnar and Tevin solve math problems from their friends in Botswana. Derek, April, Ike, Darell, Gunnar, Tevin and Jamie write a Native American math problem for our Kidlink friends.